Peridotite is a coarse-grained igneous rock that consists mainly of olivine and pyroxene. It is believed to be one of the main constituent rocks of the Earth’s mantle. It is a dark-colored, coarse-grained igneous rock and it is typically forms in volcanic pipes and is forced to the surface from great depths during a volcanic eruption. Peridotite is ultramafic, as the rock contains less than 45% silica. It is high in magnesium, reflecting the high proportions of magnesium-rich olivine, with appreciable iron. Peridotite is the ultimate source of all chromium ore and naturally occurring diamonds, and of nearly all chrysotile asbestos. It is one of the main host rocks of talc deposits and platinum metals and formerly was a major source of magnesite. It is a pistachio-green color when fresh, but weathering creates iron oxides that turn it a medium brown. The iron and magnesia-rich rock is the most common host for naturally occurring diamonds. Periodtite is also a source of valuable ores and minerals including chromite, platinum, nickel, and precious garnet. In rare instances, individual olivine crystals in periodite are large enough and pure enough to be designated a gem. The resulting gem is a semi-precious mineral called peridot. It is the dominant rock of the upper part of the Earth’s mantle. The types of Peridotite include Dunite, Wehrlite, Harzburgite, Lherzolite and Pyrolite. 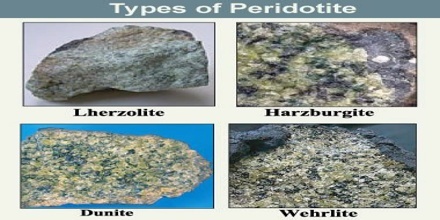 Depending upon Peridotite Texture, it is divided into types. There are many interesting facts about Peridotite which are unknown. Most of them have an obvious green color, attributed to their olivine content. 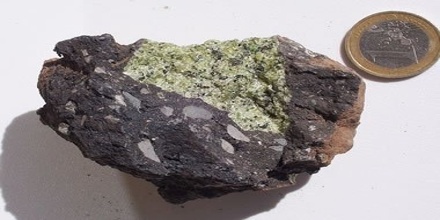 Kimberlite: It is a peridotite that is composed of at least 35% olivine with significant amounts of other minerals that might include phlogopite, pyroxenes, carbonates, serpentine, diopside, monticellite, and garnet. Kimberlite sometimes contains diamonds. Lherzolite: It is a peridotite composed primarily of olivine with significant amounts of orthopyroxene and clinopyroxene. Harzburgite: It is a peridotite composed primarily of olivine and orthopyroxene with small amounts of spinel and garnet. Wehrlite: It is a peridotite that is composed mainly of orthopyroxene and clinopyroxene, with olivine and hornblende. Dunite: It is a peridotite that is composed mainly of olivine and may contain significant amounts of chromite, pyroxene, and spinel. Along with Peridotite types and facts, Peridotite has many features based on its properties which lead to variety of its uses. Apart from various types of rocks, there are few features that are distinct for each and every rock. Features of Peridotite include: constitutes upper part of the earth’s mantle, generally rough to touch, host rock for diamond, is one of the oldest rock. 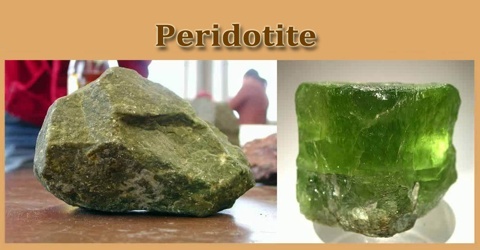 Peridotite rock is used for making sculpture and figurines. Peridotite has a coarse grain and may contain small amounts of other elements, such as spinel, chromite and plagioclase and amphibole. Peridotite is abundant on Earth and has a number of uses. 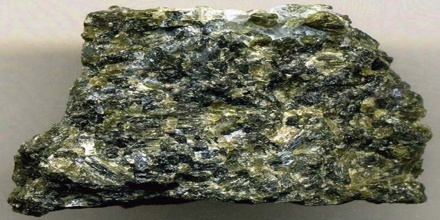 It converts into serpentinite will often contain chrysotile asbestos and talc. Because it often combines with sulfides and chromites, nickel ores and platinum metals are often extracted from the rock. Peridotite is also the primary source of the gemstone peridot. Scientists are investigating the use of peridotite to store carbon dioxide gases that are responsible for global warming. Peridotite uses in construction industry include as dimension stone, Cobblestones. Peridotite rock is not yet used in the medical industry. Some types of rocks have exceptional properties and can be used in medical industry. Reference: geology.com, dictionary.com, actforlibraries.org, britannica.com, wikipedia. Why Are We Exploring Space?